Wife of Britain's deputy PM says men who share childcare duties have "more cojones"
Speaking to Cityfathers, a group which supports working parents in London's financial district, Miriam González Durántez, the wife of Britain's deputy prime minister Nick Clegg, announced that men such as her husband had "more cojones" than men who did not share childcare duties with their partners. In comments aimed at management-types in the City, she attacked the “dinosaurs” who still believed that childcare should be the sole domain of the mother, and challenged them to essentially grow a pair and take more responsibility. 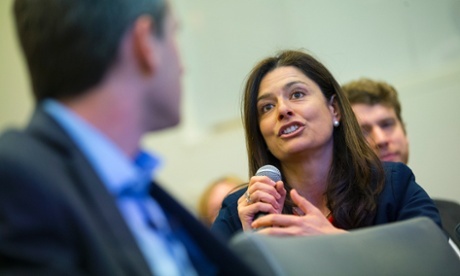 Miriam González Durántez on Wednesday interrupted a speech by her husband Nick to speak out in favour of fathers who look after their children, saying they have "more cojones". Her remarks came as the deputy prime minister made a speech in which he attacked "old-fashioned" bosses who "raise an eyebrow" when men ask for time off to look after their children. Hailing new rules on parental leave that will attempt to break down what he called an Edwardian attitude that still prevails in the work place, Clegg insisted fathers should no longer see themselves as breadwinners instead of carers. In what looked like an unscripted moment, his wife put up her hand, took the microphone, and said the measures to encourage male parenting were all well and good but that there was "an issue of attitudes". She continued: "There are many, many dinosaurs, not here but out there, who still think that if a man takes care of his own children, he is less of a man. "If you and other modern working fathers start saying, not only loudly but also proudly, that taking care of your own children and being responsible for your children does not affect your level of testosterone – and that those men who actually treat women as equals are the ones with most cojones." Chuckling, the deputy prime minister told the audience of City fathers that he was grateful he did not need to translate the word cojones, adding: "Of course I agree with you. I always do. "The idea that it is not manly to care is as absurd as to say that it is not womanly to work. Just turn it on its head. It is an absurd proposition, this informal gender stereotyping about those that take up caring professions." Clegg told the group of working parents that he and his wife had shared the responsibilities of parental leave after the birth of their three sons, Antonio, Alberto and Miguel. González, a lawyer for international legal firm Dechert, has been active in the Inspiring Women Network, which is designed to provide role models for the school-aged children of successful women in business and public life. Launching the campaign, she said: "If we do not have children, people assume we are 'frustrated'. If we stay at home taking care of our children, it is said we are 'not working'. If we have a job, we are portrayed as just 'part-time mums', and sometimes even as bad parents. "If we succeed in our professional lives, we're branded 'scary'; if we follow fashion, we're 'shallow'; if we like science, we're 'geeks'; if we read women's magazines, we're 'fluffy'; and if we defend our rights, we're 'hard'."